Mount Hymettus, a paradise so close to Athens. 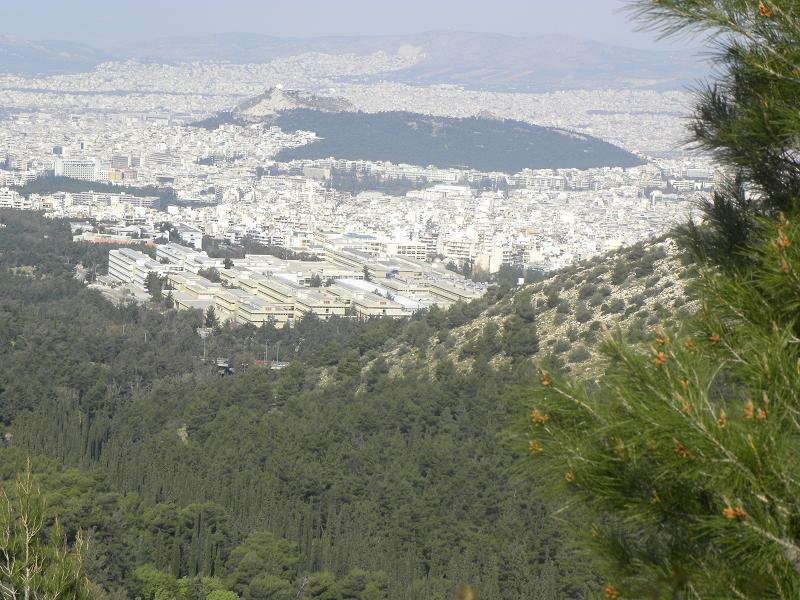 Athens, is surrounded by mountains: in the East of Athens is Mount Hymettus, (in Greek Υμηττός), sometimes written as Hymettos, Ymitos, Imitos, etc., in the west is mount Aegaleo, in the N.W. is Parnitha and N.E. is Penteli. As you can see in the picture below, this is how you can see the mountain from my neighbourhood, Kessariani. 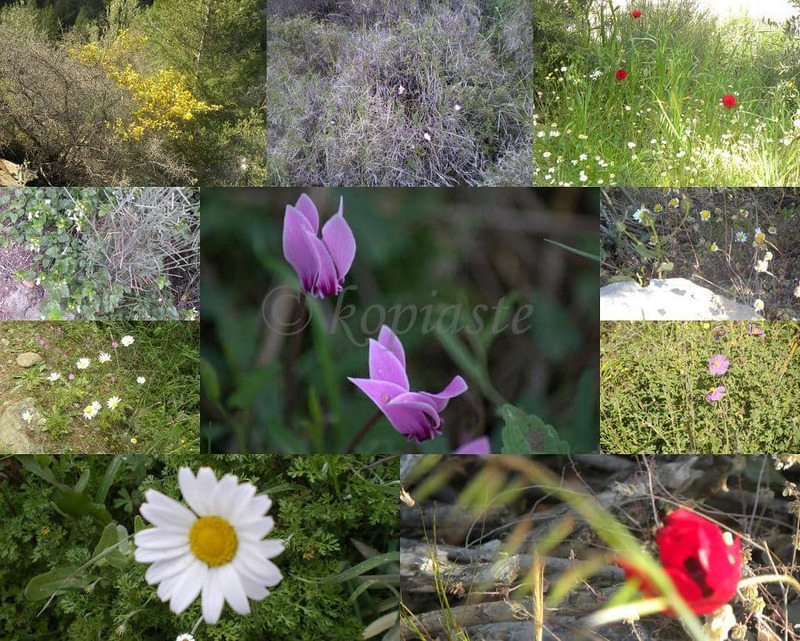 Hymettus is just a few kilometres from my house and we love visiting it often as in just a few minutes you find yourself in a different world, full of trees, flora and fauna with breathtaking views. This mountain is covered with a beautiful pine forest and has many attractions: historic monasteries, impressive caves, clearly marked footpaths, unsurfaced forest roads barred to traffic which are ideal for mountain biking, trekking and many rock climbing fields and of course offers a fantastic view. In the past water coming down from Hymettus formed Ilissos or ilissus River, but due to the dense population of Athens the river has been canalized and mostly is underground, except a small piece near The Temple of Olympian Zeus and an avenue has been constructed on its route, leading toward Paleo Faliro. We love going and walking there, whenever we can. The mountain is long and the French during the 15th or 16th century described it as tres long (16 km) and the Greeks thought that they said “trellos”, τρελλός (crazy mountain), so the mountain is also known as trellos. It is also narrow, rocky and arid, with flora that numbers over 600 plants, consisting mostly of several kinds of pine trees and cypresses but there are also olive trees, fig trees, oak trees, carob trees, judas trees, citrus trees, eucalyptus and many other kinds and lots of bushes. Wild flowers, poppies, camomile, daisies, cyclamen, etc, no wonder why the Attic honey is considered to be one of the best in the world. (All pictures were taken yesterday except the cyclamen which was taken last fall). It’s full of laurel and rosemary, thyme and oregano and lots of other kinds. We follow different routes each time but one of my favourite is the Botanical Trail, where the children of an elemetary school have labeled the plants and trees. The Botanical Trails starts from Kalopoula, where there is a small kafeneio (coffee shop) and exits near the Monastery of Kessariani. On the lower parts of the mountain, it’s fauna is, donkeys which are used for transportation where cars do not go, astray cats and dogs but the real fauna consists of rabbits, foxes, turtles, hares, porcupines, serpants and of course lots of birds, among them endangered species. but there are a lot of rest places which are perfect also for picnics. They say that there are underground passages which take you all the way to Athens but all these entrances have been sealed with no explanation. You can find various ancient and Byzantine monuments on the mountain. You can see on the wall of a church, some ancient ruins have been used to build it. Finally here are some breathtaking pictures with a view of the whole area of Athens up to Piraeus. I have zoomed in some pictures where you can see the Acropolis, Lycabettus, the Port of Piraeus up to Salamina Island and on the foothill is Panepistimioupoli (the Universities). View of Piraeus.. up to Salamina..
View of Lycabettus and University.. Finally, view of The Acropolis.. the most beautiful monument in the whole world. Nice tour of your surrounding areas Ivy…we can really see how vast and populated Athens is from the pictures. Ivy, a beautiful trek and a well documented post:). The little I know of Athens and the surrounding areas remind me so much of Lebanon, except better, less ravaged by wars, pollution, erosions, etc. To be able to go on hikes a few kilometers from your home, why, I would never take a vacation, you don't have to ! Love the photographs Ivy. I was born and raised in Athens, lived there my whole life, except for the last 3 years that I'm in Holland and I have never been up the mountain Ymιttos! Can you believe it?? I always use to stare at it from afar! Now I can see a little bit more of it thanks to your photographs. You've inspired me to hike up there the next time I come home! Thanks! Beautiful, Ivy! I can't wait to visit Greece this summer! Shall be looking forward to meeting you Natasha. We don't have all the plans finalized yet but we'll be staying few days in Crete and a few days in Athens in very beginning of July. Great, then we can talk again when the time comes. Wild cyclamens were my favorite flowers as a child. I loved finding them in the woods. What an interesting place to visit! Thanks for sharing: a very informative post. Are you coming to Athens Juliana? What a beautiful place! The views are just breathtaking! P.S For the ice-cream she used crème fraîche; use at least 35% full fat cream if you want it to taste creamy. I go up ther with the mountain bike a lot. Great to have the mountain so close to the city. Fancy meeting you up there !! What great photos! Looks like a wonderful place for hiking, and the view of the Acropolis is stunning. I hope to visit it some day! Love the photos Ivy – a real paradise! I remember visiting this area in my first trip to Greece way back in '96! Acropolis from your blog; I know has been redone – so i can imagine the view of it is even better then in 1996! Wish I were i there! Thank you for the virtual trip of this so beautiful place. 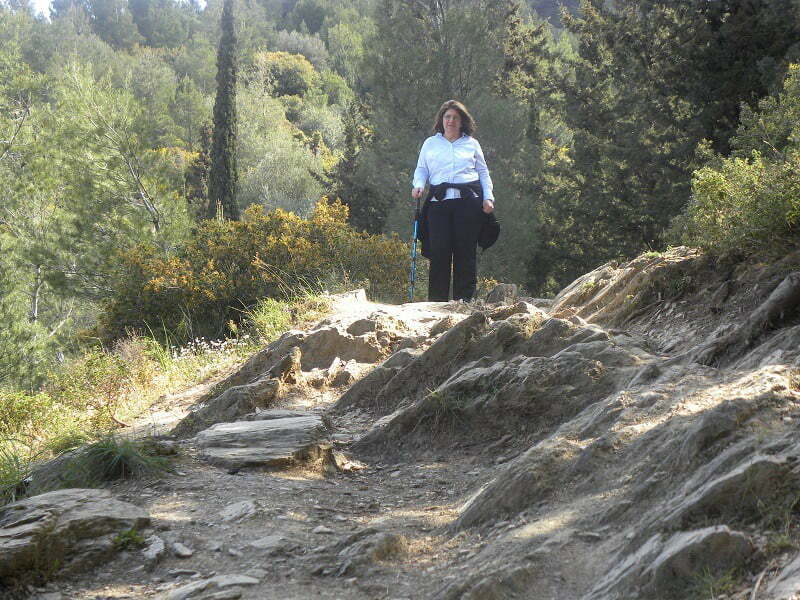 I hiked Mount Hymettus while in Athens last month. It was a very nice place. Really highly recommended for anyone looking for nice views of Athens. Nice to meet you Brandon. It’s one of our favourite places to go walking up there. I’m visiting Athens now and hadn’t heard about this area. Thanks for the great information! Hello everyone, can someone explain me precisely how to get to this apparently beautiful moutain by public transportation? Hell Claire. I have sent you an e-mail explaining how to get there. Hi. Totally an amazing place for hiking. I have been there quite a few times as this was my old neighborhood. Parnitha is also exciting. I’ve never been to Athens before but after reading your blog i am tempted visit this place. I agree with you, Athens is very nice place surely i will visit there in future. I like Athens, which is wonderful place. I wish to visit it one day! I am doing a project on Athens and It wants me to give some of the Natural characteristics and Human characteristics on Athens greece. I am having trouble finding the natural ones. Would you kindly inform me what are the Natural characteristics of Athens Greece?